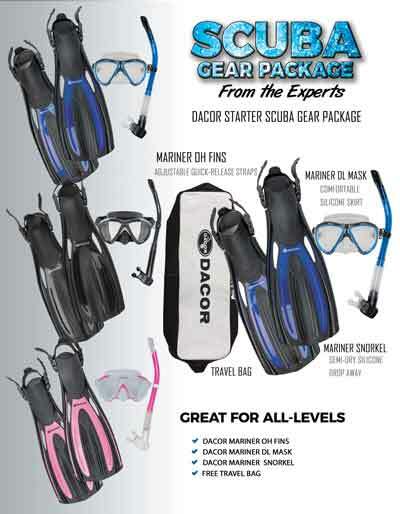 Complete Dacor mask, fin, and snorkel scuba diving package. The Dacor Mariner DL has a comfortable silicone skirt for an easy fit. Silicone strap with push button quick release. Four 'grip' points for easy clearing with or without gloves. Low volume, two window design provides great vision. The Dacor Mariner snorkel has a semi-dry splash guard top for dry breathing on the surface, in even choppy conditions. The Mariner Snorkel comes with a quality silicone mouthpiece that reduces jaw fatigue and a silicone drop away flex tube for comfortable use while diving or snorkeling. The snorkel clip makes attachment to a mask fast and easy. The Dacor Mariner fin comes in five adult sizes and has an adjustable strap for excellent fit and comfort. The channeled blade offers strong propulsion without being too stiff. Five comfortable foot pockets result in a perfect fit, no matter what size foot. Blade is designed with strong but flexible side rails and a center channel for optimal water retention throughout the kick cycle. Easy to adjust, quick release strap and buckle. Buy Scuba Mask Fin Snorkel Package by Dacor from Divers Supply at the best price. Scuba Mask Fin Snorkel Package by Dacor comes with full Manufacturers warranty because Divers Supply is an authorized dealer for everything we sell.